University of Chicago Press, 9780226470757, 352pp. Who was Vivian Maier? Many people know her as the reclusive Chicago nanny who wandered the city for decades, constantly snapping photographs, which were unseen until they were discovered in a seemingly abandoned storage locker. They revealed her to be an inadvertent master of twentieth-century American street photography. Not long after, the news broke that Maier had recently died and had no surviving relatives. Soon the whole world knew about her preternatural work, shooting her to stardom almost overnight. But, as Pamela Bannos reveals in this meticulous and passionate biography, this story of the nanny savant has blinded us to Maier’s true achievements, as well as her intentions. Most important, Bannos argues, Maier was not a nanny who moonlighted as a photographer; she was a photographer who supported herself as a nanny. In Vivian Maier: A Photographer’s Life and Afterlife, Bannos contrasts Maier’s life with the mythology that strangers—mostly the men who have profited from her work—have created around her absence. Bannos shows that Maier was extremely conscientious about how her work was developed, printed, and cropped, even though she also made a clear choice never to display it. She places Maier’s fierce passion for privacy alongside the recent spread of her work around the world, and she explains Maier’s careful adjustments of photographic technique, while explaining how the photographs have been misconstrued or misidentified. As well, Bannos uncovers new information about Maier’s immediate family, including her difficult brother, Karl—relatives that once had been thought not to exist. This authoritative and engrossing biography shows that the real story of Vivian Maier, a true visionary artist, is even more compelling than the myth. Pamela Bannos is professor of photography in Northwestern University’s Department of Art Theory and Practice. "Stories--like snapshots--are shaped by people, and for particular purposes. There's always an angle. A new biography, Vivian Maier: A Photographer’s Life and Afterlife, by Pamela Bannos, strives to rescue Maier all over again, this time from the men who promulgated the Maier myth and profited off her work. . . . Almost point by point, Bannos refutes how Maier has been marketed. . . . The achievement of Bannos's intelligent, irritable self-reflexive study is in its restraint. She unseats the ghost and restores to us the woman--but in her own words and images, and without psychologizing. It's a portrait as direct as any of Maier's, and what a distinct pleasure it is to meet her gaze again." "Offers a level of detail and thoughtful reflection that no previous book on Maier has. . . . This book is by far the finest yet published on the artist. I believe it will become a classic in the field." "Bannos offers a clear-eyed investigation of Maier's life, aiming to penetrate the myths surrounding her and to assess her stature as an artist. . . . In alternating chapters, Bannos juxtaposes Maier's biography with her afterlife. She effectively contextualizes Maier's aesthetics within the history of photography, and she makes a persuasive case for her talent and originality. In the end, though, the author is left with unanswered questions about Maier's personal life, her motivations to photograph, and her artistic aims. A sympathetic portrait of an artist who remains elusive." "Patiently and lucidly detailed by Pamela Bannos in her nearly forensic biography--which unties many knots and brings order to what was previously a chaotic welter of information and misinformation." "At last, we have a way of separating the individual from the myths that have been constructed around her. The revelation of greater context is the beating heart of Bannos's book, and she’s clear from the start that she sees it as an act of feminist reclamation." "Meticulously researched. . . . Bannos's biography is a vital contribution to understanding the historical relevance of Maier's work and an important challenge to the way in which Maier's work and legacy have been represented thus far." "By carefully analyzing the artist's images, Bannos skillfully tracks her entire adult life: work history, where she lived and traveled, and her interests, and is able to look past the mystique of the 'eccentric nanny with a camera' to tell the true Maier story. . . . The book's strengths are Bannos's exhaustive research and her ability to connect the greater history of photography in to the account of Maier's curious life. This extraordinary work is recommended for all art history and photography enthusiasts." "Bannos's engrossing, meticulously researched biography sensitively reconstructs Vivian Maier's very private life in conjunction with her now massive public legacy as a visionary photographer. Many questions remain and always will. However, Bannos's comprehensive narrative ensures that Vivian Maier's story and the treasure trove of her work will live on, transcending the world of photography. . . . A fascinating glimpse into the life of an eccentric, legendary photographer whose work came to prominence only with her death." "Bannos's engrossing, meticulously researched biography sensitively reconstructs Vivian Maier's very private life in conjunction with her posthumous legacy as a visionary photographer. Many questions remain and always will. 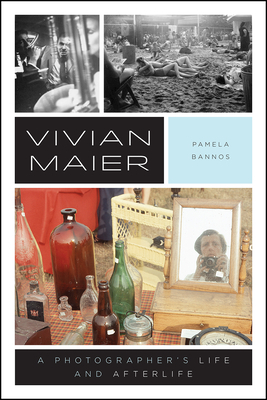 However, Bannos's comprehensive narrative ensures that Vivian Maier's story and the treasure trove of her work will live on.. . . . A fascinating glimpse into the life of an eccentric, legendary photographer whose work came to prominence only after her death." "Her approach is refreshing--a clear-eyed, empirical account that counters the willfully obscure, ego-driven yarns spun by the buyers. In this light, A Photographer’s Life and Afterlife is a work of real integrity in a field lacking such a genuine spirit of inquiry. . . . She directs her energies on getting the counternarrative right, and this she manages admirably. . . . In many ways, Maier and the various ways she has been understood, from the 'mystery nanny' to the 'street photographer,' is a construction and reflection of our time and much less of her own. This is what makes Bannos’s biography so welcome. For the most part she lets Maier emerge simply from what she did--her travels, her photos, her actions. Only in her closing remarks does Bannos give us the swiftest brush strokes of a portrait, which is worth remembering for it is one of the most lucid and accurate summations of Maier's work to date." "Authoritative. . . . Fascinating, thorough. . . . Up to now, Maier's story has been told mostly by Maloof and two other collectors who owned much of the prints, negatives, undeveloped film and personal effects she left behind without a will or instructions as to their disposal. Unlike those collectors, Bannos has no significant financial stake in the Maier myth. Also unlike them, she is a photographer herself and a woman, and thus more naturally able to put herself in Maier's shoes."